​The Edwardian Era and WW1 from a Different Perspective. 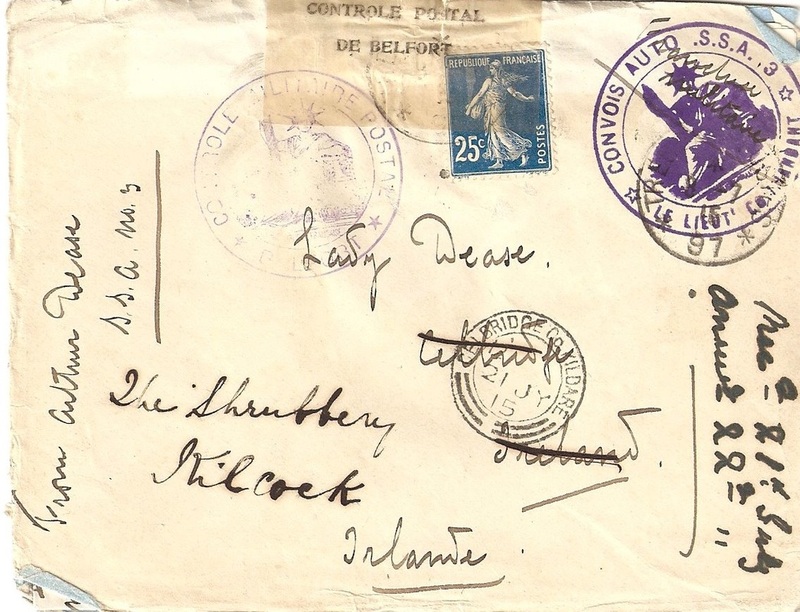 ​These WW1 and Edwardian era letters home are a personal first-hand account of the late 19th and early 20th century from an extraordinary perspective. Take a fresh look at WW1 - It was much more than mud and trenches. Arthur Dease has an important story to tell, these first world war letters are an excellent eyewitness account of WW1 and Edwardian times. World War 1 Letters home from the front lines, letters from behind the lines, letters from the trenches and letters from the home front in London. There is plenty of talk of mud and trenches, gas attacks (experienced first hand by Arthur), home front and society gossip. Most importantly Arthur's letters are an Edwardian and World War One human interest chronicle written by an intelligent and articulate observer from a very different perspective, not a tedious conventional military history. These letters are social history at its best. These primary source World War 1 and Edwardian letters home are an almost unique view of late Victorian and the early 20th-century world. Arthur writes about the First World War, the people, social and political events of the day as they unfolded, and of course, the battles, trench warfare and horrors he witnessed first hand. These letters are Arthur's eyewitness account of the late 19th and early 20th centuries and WW1 and the rapidly changing times and culture he lived in an excellent social history. There is no political correctness, just a good first-person observation of a vanished society. Each generation sees the war from a different perspective; history is always reinterpreted, but Arthurs WW1 letters home tell the story of the moment. 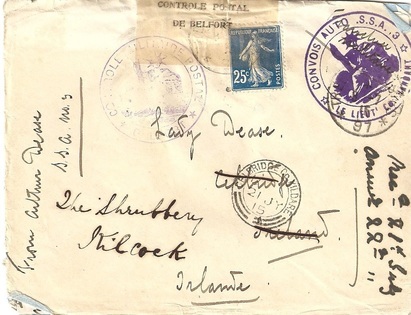 Arthur also travelled around the world and sent a large number of letters home during the period 1892-1920. I have also published some of those from the USA, South America, and Australia. I try to add new items regularly. These letters also show a fascinating glimpse into the privileged world of an Edwardian gentleman and a picture of the lost pre-WW1 world. ​ Text I have added for the sake of clarity is enclosed in [ ] brackets. Some of the words, place names or people names can be difficult to read and I replace those with "?????? ", but again I will revisit these letters and amend where possible. There is soldiering & soldiering, doing it comfortably at home strutting about in Kaki [sic] in safety & this sort of thing where one has no rank, no pay, bombed & bombarded not to say gassed & living in the woods, caves or cellars. Of course, we all know that The Great War ended in November 1918, try to read these letters without the benefit of hindsight, Arthur's letters tell the story of the moment, the human touch behind history. When transcribing these letters I leave the grammar etc. as it was written. I also omit the more mundane sentences or paragraphs, replacing these with "...", however I will revisit all of the letters in time. 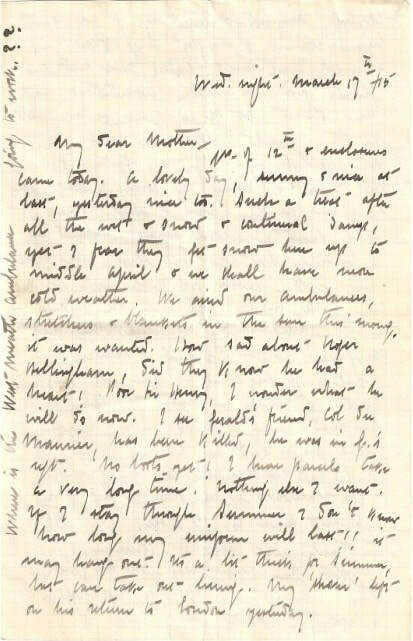 First page of a typical WW1 letter home from Arthur.